This statistic gives information on the share of time spent on various app categories on iOS and Android devices as of June 2015. During this period of time, it was found that 15 percent of U.S. mobile device time was spent on gaming. Overall, 86 percent of mobile device time was spent on mobile apps. Mobile apps began to appear in 2008 and were originally designed for simple information retrieval in the form of calendars, email and weather forecasts. However their popularity quickly encouraged developers to expand into other categories including gaming, banking and shopping apps. 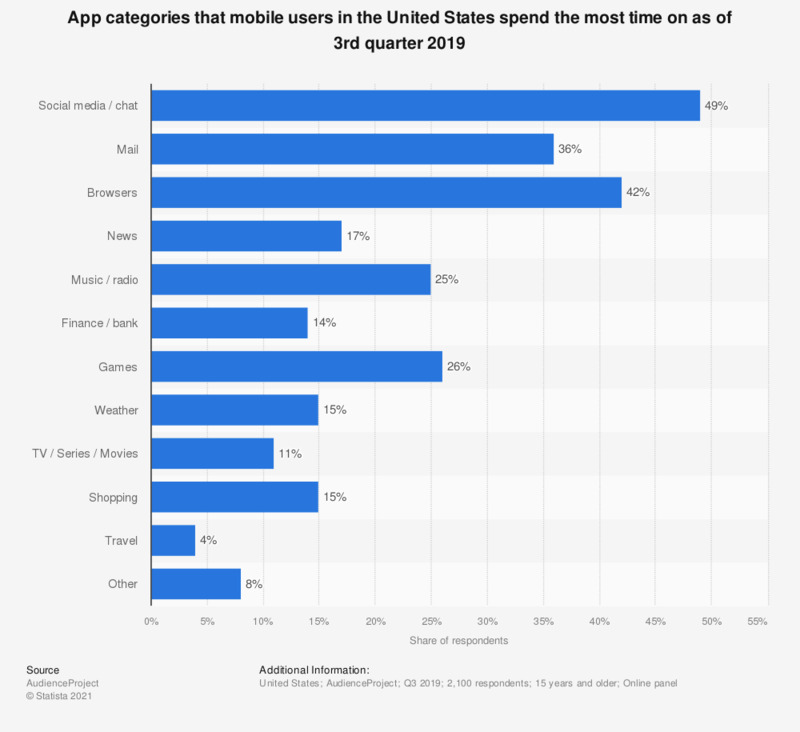 Compared to the statistic for time spent on mobile apps worldwide, in the United States during June 2014, more time was spent on social networking apps on iOS and Android devices with 25 percent of all app usage time. Gaming apps, on the hand were ranked second with 16 percent of total app usage time. Time spent on selected mobile social networks in the U.S. has been measured in billion monthly minutes. During February 2013, smartphone users in the U.S. spent 114.28 billion minutes on Facebook. Facebook dominated the field for social network usage, with its nearest rival Instagram responsible for 8 billion minutes of user’s time for the same month. Twitter, was the only other social networking app to breach the 1 billion minute mark, with 5.33 billion minutes. Mobile devices allow users to choose between mobile internet and mobile apps. The percentage of time spent on mobile web and apps on connected devices in 2013 and 2014 is revealing of user preferences. In 2013, 80 percent of all time spent on connected mobile devices was spent on mobile apps and in 2014, this share increased to 86 percent. These figures reveal that users prefer to spend their time on apps rather than the internet when using their mobile devices. Did you use your mobile device to get news stories or other content provided by news organizations in the past seven days? Which of the following activities have you done on your smartphone before dining at a restaurant?